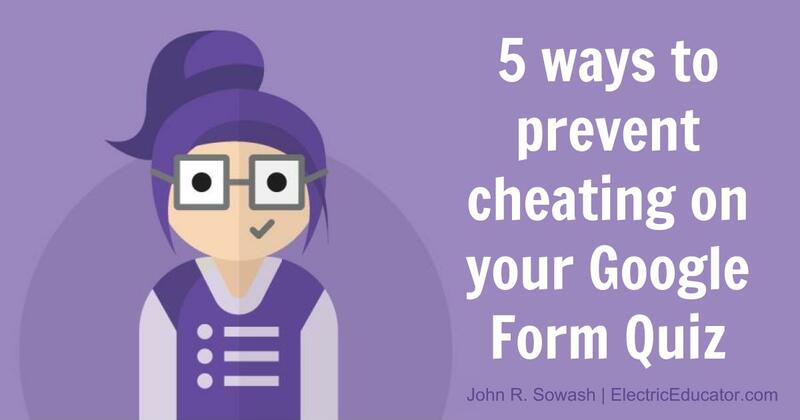 Your Google Form is only as good as the data it collects. If your data is a mess, it won’t be very useful. Checkbox questions: set a minimum or maximum number of choices that can be selected. Short Answer question: use the Regular Expression feature to get consistently formatted phone numbers, zip codes, or state abbreviations. 2. Make your form look pretty! While Forms has added the ability to change the header image, background, and some limited font options, with a little effort you can really make your form look nice! 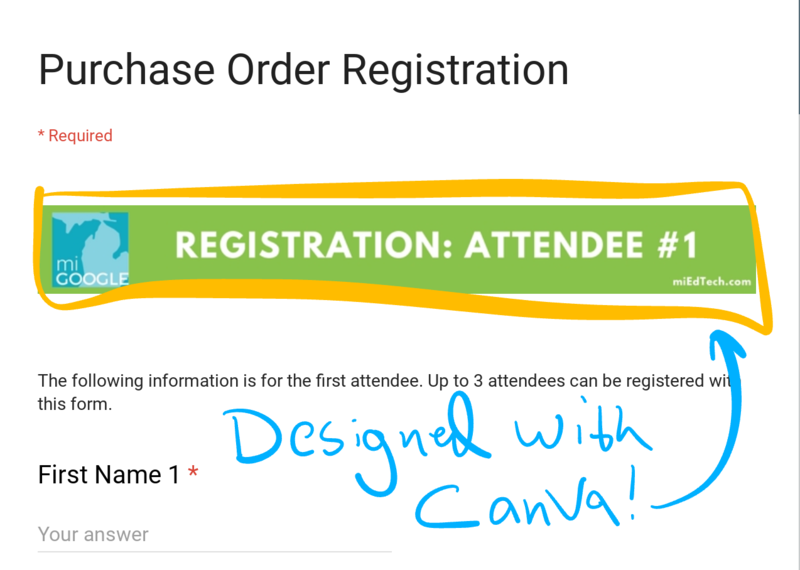 I frequently split my form into different sections and use the image element to add graphics. I use Canva to create most of my form graphics. I discovered that the “Leaderboard” template works really well with forms. Another trick you can try is adding emoji to your form questions and answer choices. I use the 🔥and 👉 symbols to emphasize important information or 1️⃣2️⃣3️⃣4️⃣ if I have a set of steps I want to clearly explain. The Emoji One Chrome extension is what I use to access emoji icons on my Chromebook (works on Mac and PC too!). Once you’ve mastered the essential elements of forms, you MUST dive into add-ons. Add-ons are like apps for Google Drive. 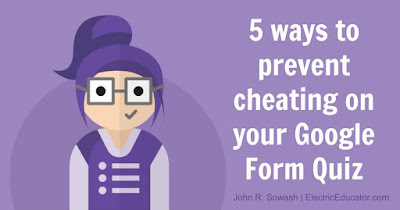 To become a true Form Fanatic you need to be familiar with add-ons for forms AND sheets. 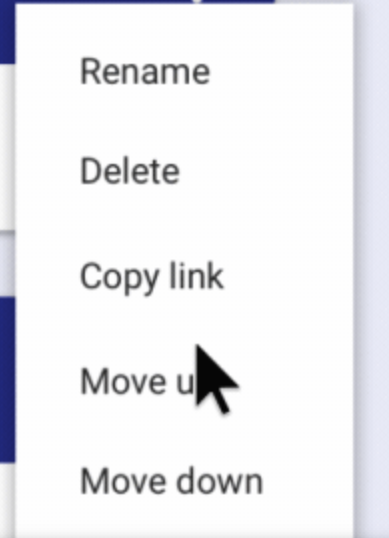 Choice eliminator removes MC options from your form after they have been selected. Great for sign-ups, volunteer opportunities, and reservations. Form Limiter will set limits on how long your form is available or how many responses a form will receive before it is turned off. Great for forms with deadlines. Use Email Notification for Forms to send out email or mobile phone notifications when a new submission is received. Copy Down isn’t super exciting, but it’s very helpful! I use Copy Down to apply formulas to incoming form data to create automatic calculations. FormMule is an email merge utility that you can use to send customized emails based on form responses. I use FormMule when I need to run calculations on my form data before sending out an email. There are a LOT more add-ons, but those are some of my favorites! 4. Filter, Sort, and Pivot your Data! We use Google Forms to collect data. Once someone submits a form, the information gets dumped into Google Sheets...and things get interesting! Sort - Sort a column in your spreadsheet to organize your data alphabetically or numerically. This is basic, but very useful! Filter - Filter your sheet to isolate the information you want to see. For example, you might use the filter option to hide quiz scores for your first and third hour classes so that you can review the scores from second hour. Pivot - A pivot table lets you look at your data from a different perspective. This is especially helpful with things like test scores or survey information. For example, you might “pivot” your data to see if the 8th grade students who had failing grades in math also struggled in their ELA courses. Data analysis is super important topic. 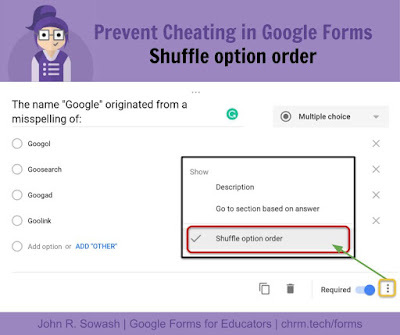 If you want to learn more, I recommend that you connect with Ben Collins, the smartest Google Sheets guy I know! 5. 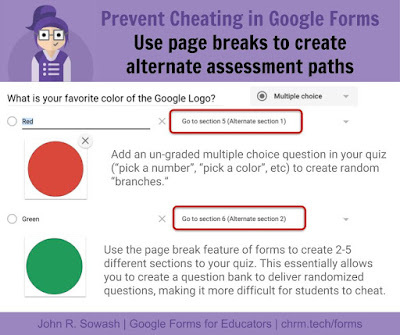 Autograde and lock your quizzes! 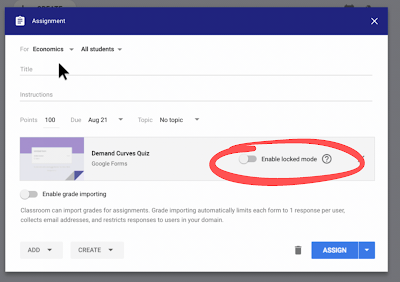 Google Forms has a special quiz mode that will auto-grade student choices! Stop wasting your precious time hand-grading paper quizzes! Auto grade them! 📝 Matching Question - use the grid question type to set up a matching question. Be creative... there are LOTS of possibilities. 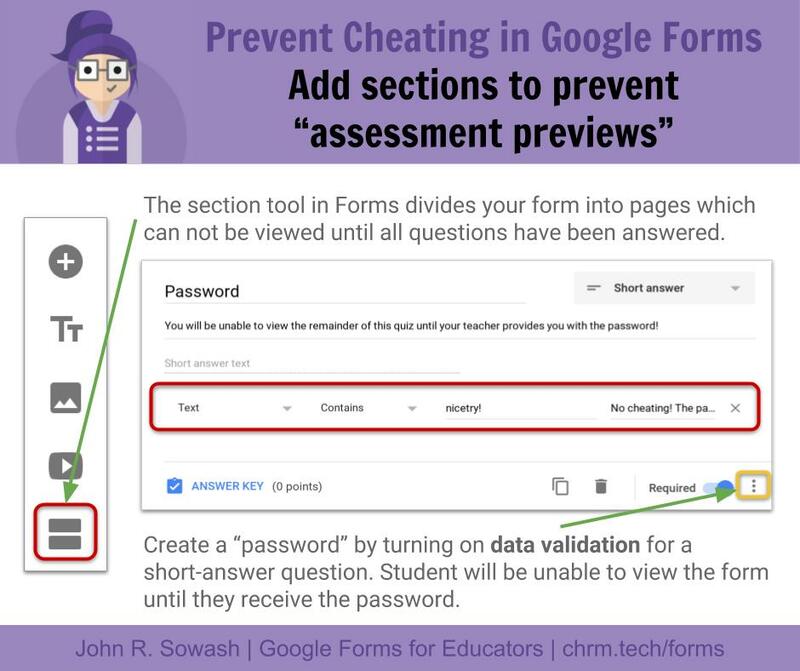 You may have heard about the new LOCKED MODE for Google Forms. I shared an early review a few months ago. When enabled, locked mode will prevent students from accessing other information during a quiz. Locked mode is NOT available yet...but it should be very soon (March?)! Watch this video or read this blog post to see how it works! Are you ready to become a Form Fanatic? 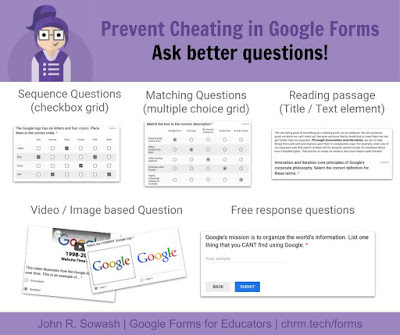 Each spring I teach a 5 week Google Forms masterclass. 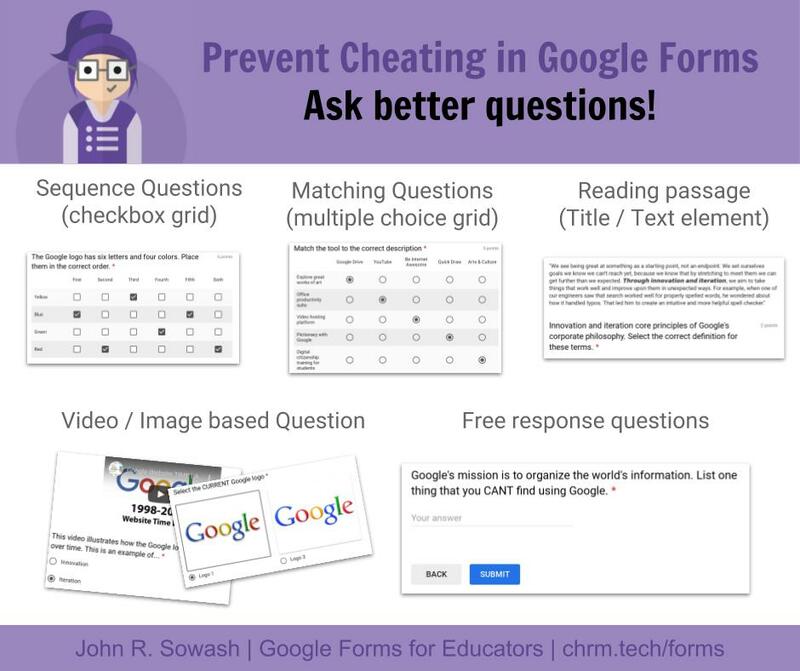 Join me for a deep dive into Google Forms! This course is perfect for classroom teachers, tech coaches, and school administrators! Before you can use technology to teach math...science...language arts...etc, you need to make sure that your students have mastered some basic skills. Students may develop some of these skills in computer class (if your school offers it), but subject-area teachers will still need to teach some basics early in the year. 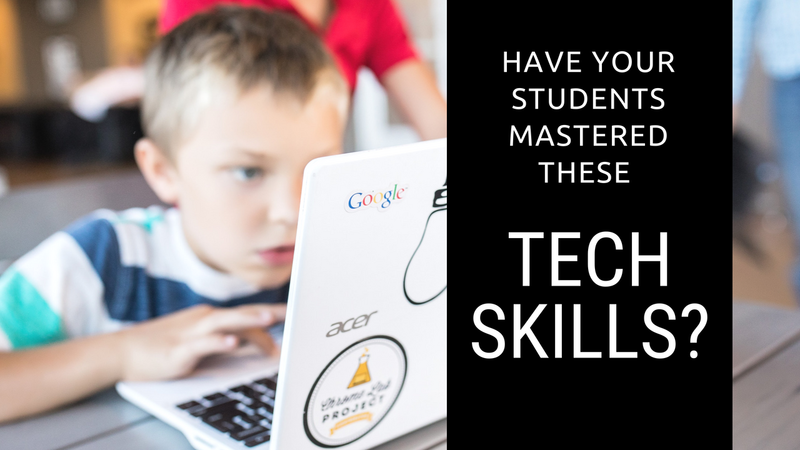 So what are the most important, basic, essential technology skills that your students need to master? 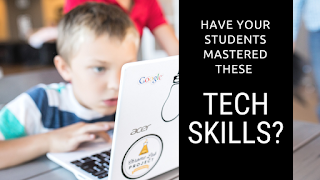 To help you answer this question I created a technology skills checklist. This check list identifies the most basic things that you should teach in your classroom at the beginning of the school year. These skills are so basic that most middle and high school students will be embarrassed to admit that they don't know them. You will need to think of a fun, creative, non-threatening way to weave these skills into the first 1-2 weeks of the school year. Just because students are "digital natives" doesn't mean that they know how to use technology effectively. We need to help them. One idea for teaching a lot of these basic skills is my "selfie trading card" activity. It's fun, easy, and will cross off a lot of the skills listed on my check list. Check out this video for details (the trading card template is in the description of the video!)! If tech is an important component of your classroom, it's worth devoting some time early in the school year to help your students be successful. Each month I send out tips like this to my email subscribers. My monthly email features practical tips and suggestions for using technology in the classroom. Interested? You can subscribe below! 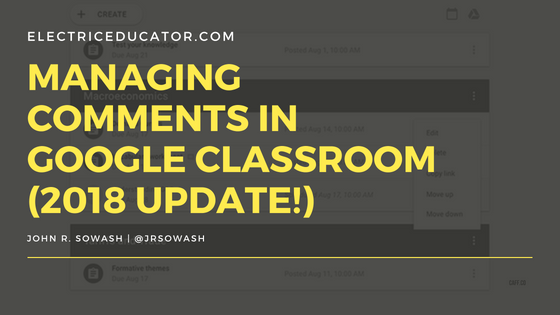 Get the Google EDU update by me, John Sowash! Note: this is a really long, detailed blog post. I've created a really nice PDF version of this post that you can download here. Brand new to Google Classroom? These resources will help you set up your very first class! 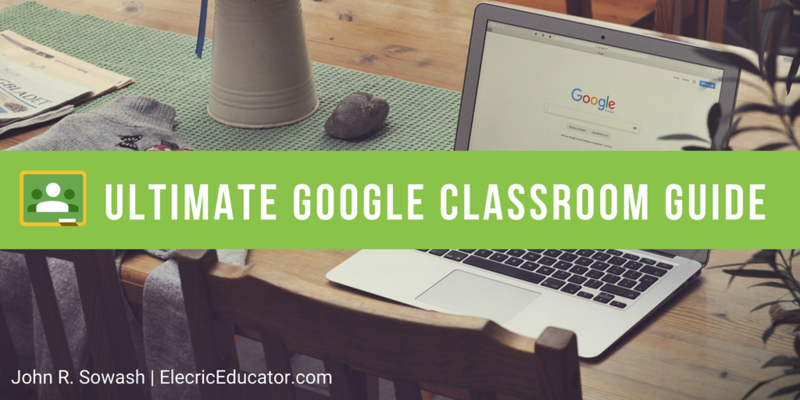 Want to customize how your classroom looks? Check out these header templates! 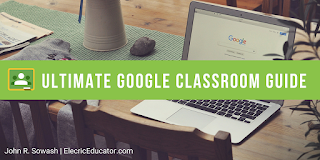 This Chrome extension lets you push content into Google Classroom from anywhere on the web. You can also use it to push websites directly to student screens. 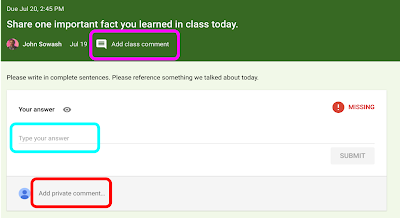 Google Classroom makes it easy to assign individual work and whole-class assignments. But what about group work? 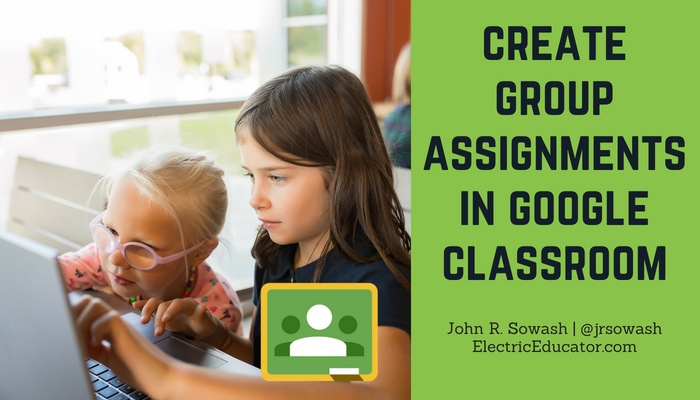 It takes a little bit more effort, but you CAN facilitate group work through Google Classroom. 🎥 Note: If you would prefer a video overview of this process click here! For my project, two students will work together to research an injury to the human body and identify the proper treatment. I created a Google Doc with the requirements and guidelines for the project. This is my template file. It is organized in my class resources and templates. I use this file every year, so I don't want students editing my original. I make a copy of my template for each group. I have a smaller class so I only need three groups. I make a copy and rename the file for group 1, 2, 3, etc. You will want to put these files somewhere you can easily find them. I usually stick them into the Drive folder that is linked to my class. We only want the members of Group 1 to get this assignment. 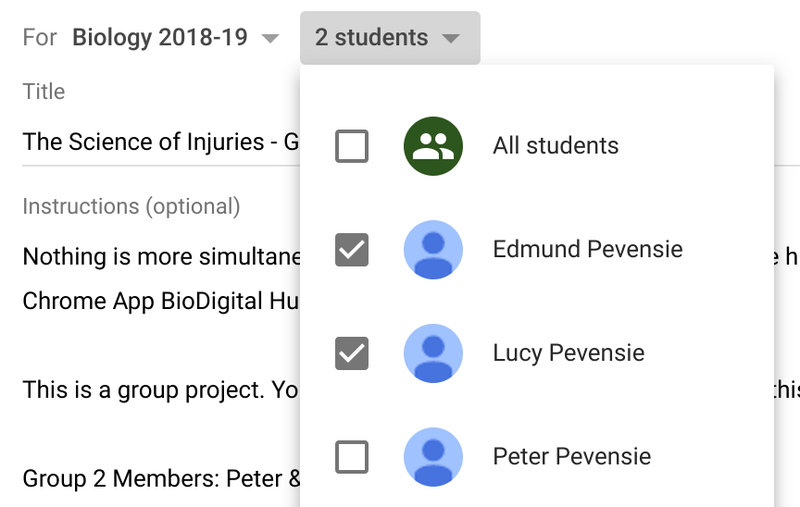 Click the drop down for "students" at the top of your assignment and select the members of the group. Now you can click the assign button! Now we need to send the assignment to the rest of the groups. Use the "reuse" option in classroom to copy the assignment you just posted! Change the title of the assignment to include "group 2..."
Repeat for the remainder of your group! The end result is a nice list of the assignment for each of your groups! Each student will only be able to see the documents assigned to their group. You (the teacher) will have access to all of the group documents. 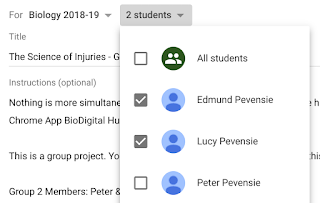 This is one of many different ways to organize group projects in Google Classroom. If you have suggestions or modifications for my process please leave a comment! This past week during the 2018 ISTE conference in Chicago, Google made quite a few announcements that will impact you this fall when you return to school. 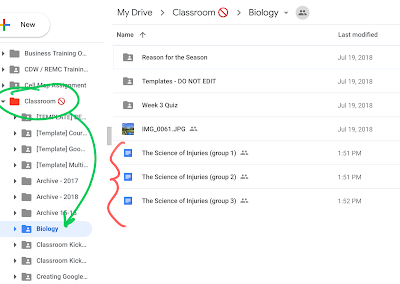 Google is re-thinking how content is organized in Classroom. Up to this point, everything has been posted in to the classroom "Stream" which gets quite cluttered and crowded after a full year of assignments, announcements, and questions. 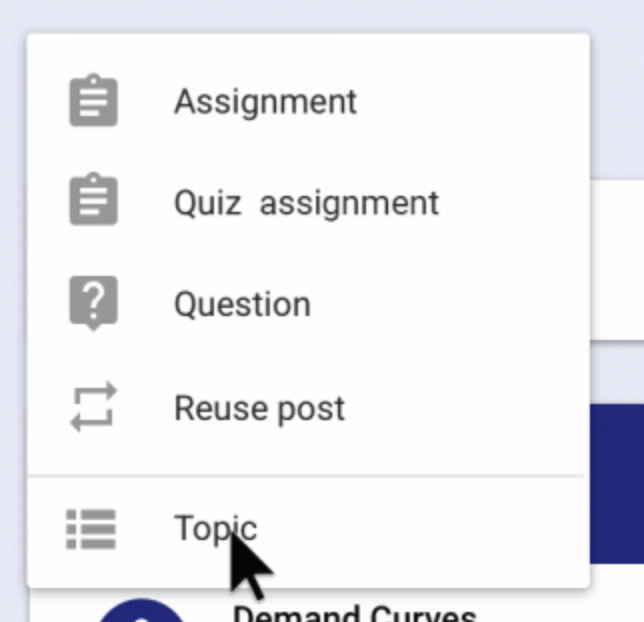 The updated classroom adds a new "classwork" tab and provides allows teachers to logically group and organize assignments into modules and units. This change results in better classroom management for teachers, and makes it easier for students to locate assignments. 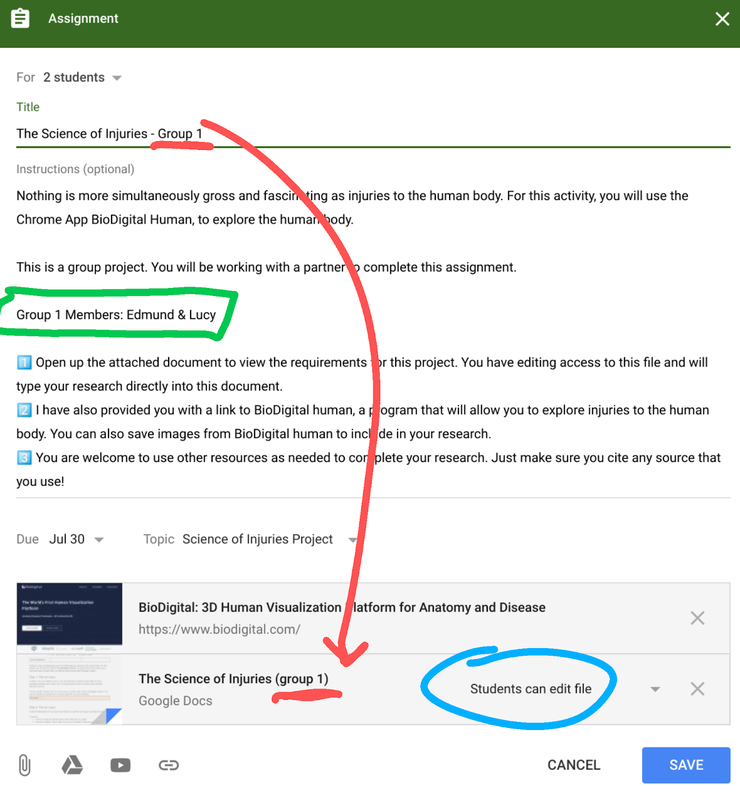 Currently, the topic feature does not provide any visual grouping of assignments. 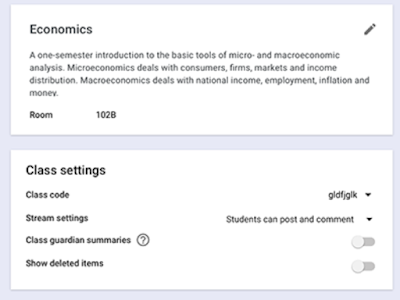 In the new classwork page, a bold banner identifies the topic and groups assignments together. Currently, we can only move assignments to the TOP of the stream. We can't manually order them. Assignments and topics can now be moved up and down inside of the classwork page. The stream will still be available, but now provides a overview of upcoming assignments and current class discussions. "People" get their own page! Teachers, students, and parents interact with classroom on different levels. The new "people" page make managing this groups easier. On the people page teachers can add and manage their co-teachers, make changes to their class roster, and configure the guardian access. 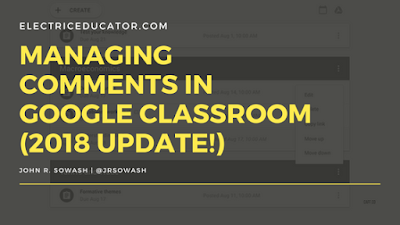 All of your Classroom settings in one place! I'm super excited about this update. All of the settings for your class are now in one central location (look for the "gear" icon). 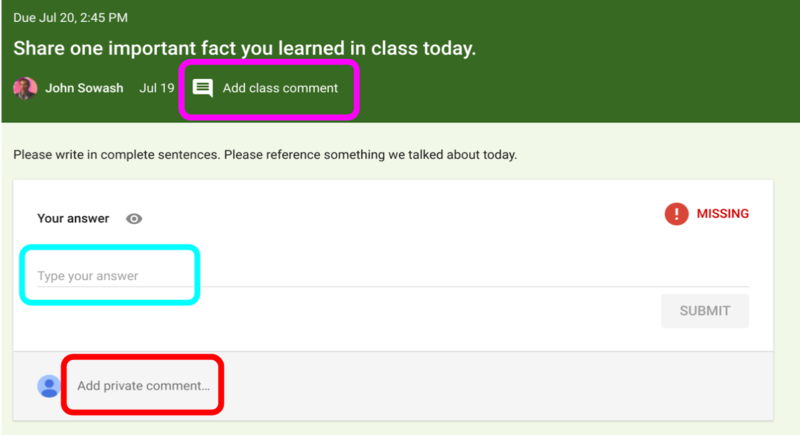 In the past, your class code was on one page, the comment settings on another, co-teachers on another, etc. It took a lot of clicks to set up your class. 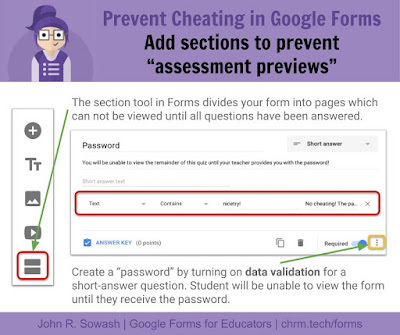 Google Forms has always worked well with Classroom, but now it's even better! 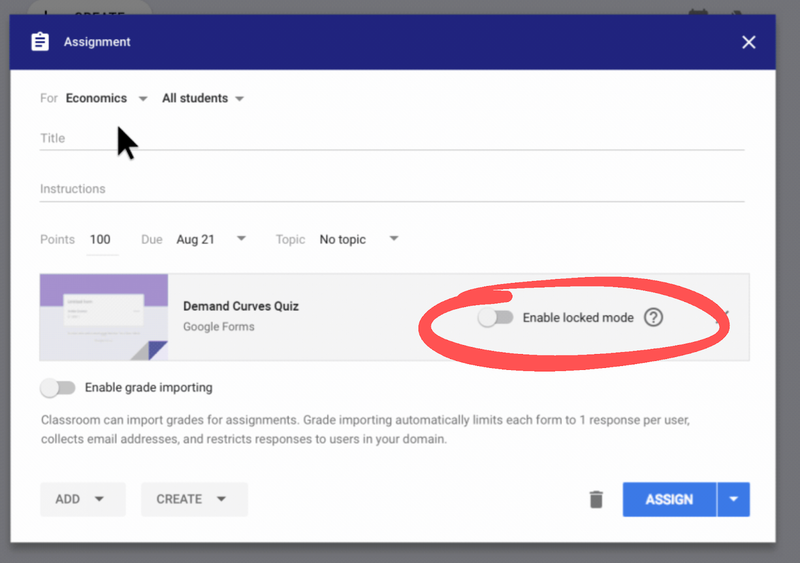 You can now create a new form quiz directly in classroom. 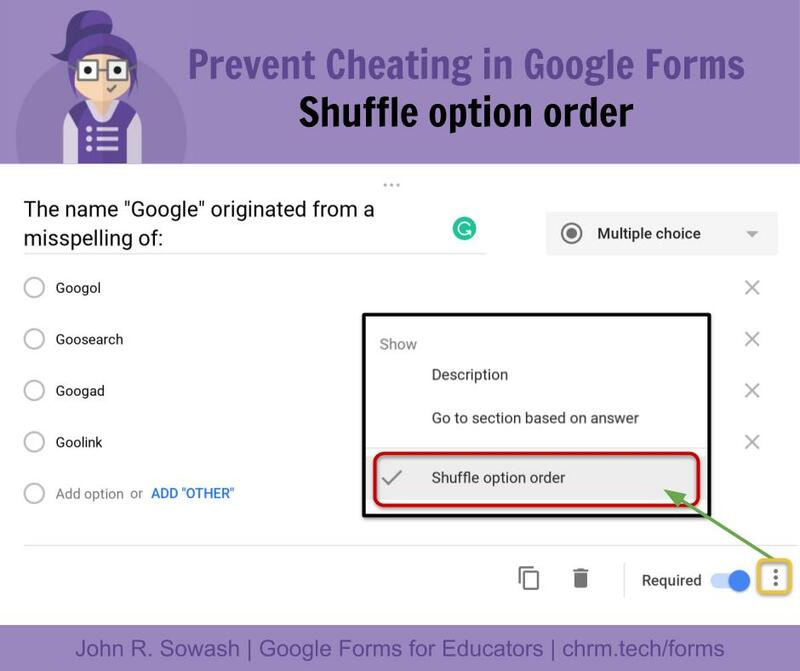 No need to jump into Google Drive first. This new feature is called a "quiz assignment." 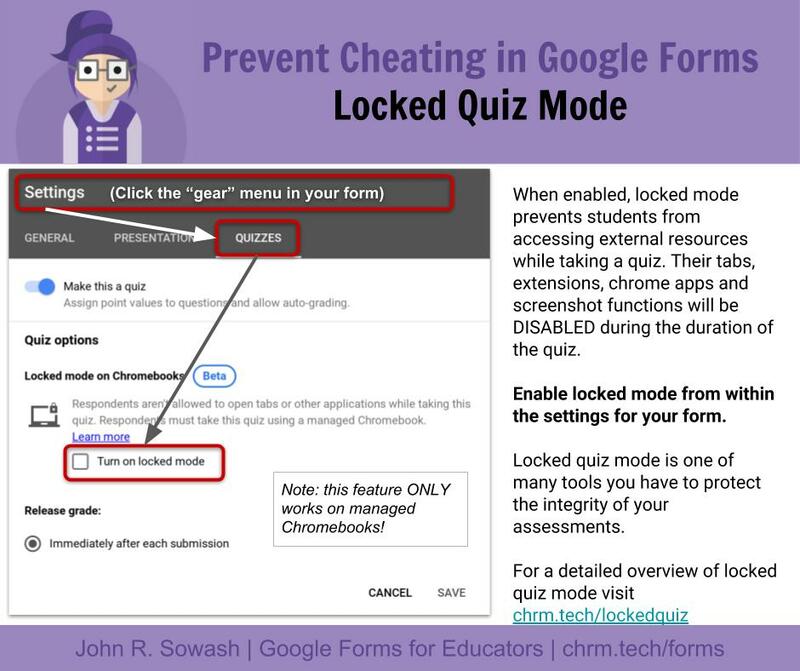 If you are using Chromebooks in your classroom, you can also turn on "locked mode" to prevent students from looking up answers during a quiz! This feature will only work on district-managed Chromebooks. When can I test these awesome features??? The official word from Google is that these features will be available to everyone in "August". No specific date has been provided. You can request early access by filling out this form. No word on how quickly these features will become available to the early adopter group. Let me help you kickstart your school year! 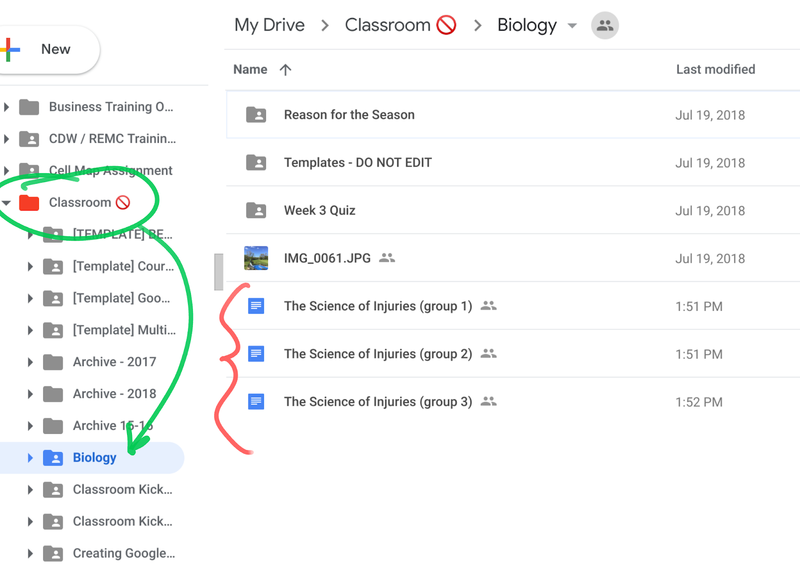 I am offering an online course called Classroom Kickstart to kick off the 2018-19 school year! 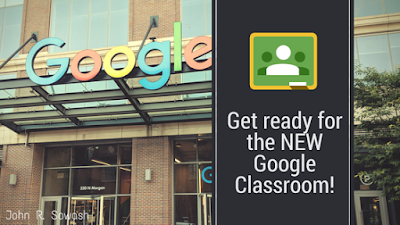 This is a 5 week course which will help you launch the 2018-19 school year using Google Classroom. You’ll implement incredibly simple strategies which will improve daily instruction and classroom organization. The course costs $99 and begins on July 29, 2018. For more info on the course, head over to chrm.tech/kickstart.